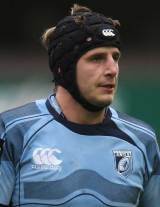 Cardiff Blues and Wales openside Robin Sowden-Taylor made his international debut as a replacement against Italy during the 2005 Six Nations before featuring against the All Blacks the following November. To a large extent Sowden-Taylor has had his route to international recognition blocked by Martyn Williams, who, when fit, occupies both the Cardiff and Wales openside berth. Sowden-Taylor started against South Africa for Wales in the 2007 Prince William Cup match, while Williams was in his short-lived international retirement. Williams reclaimed the openside position during the 2008 Six Nations, although Sowden-Taylor started against South Africa on Wales' summer tour while his rival was out injured. Sowden-Taylor was released by the Blues in the summer of 2010 and he subsequently joined the Dragons, where he spent a short time before announcing his playing retirement in January 2011.